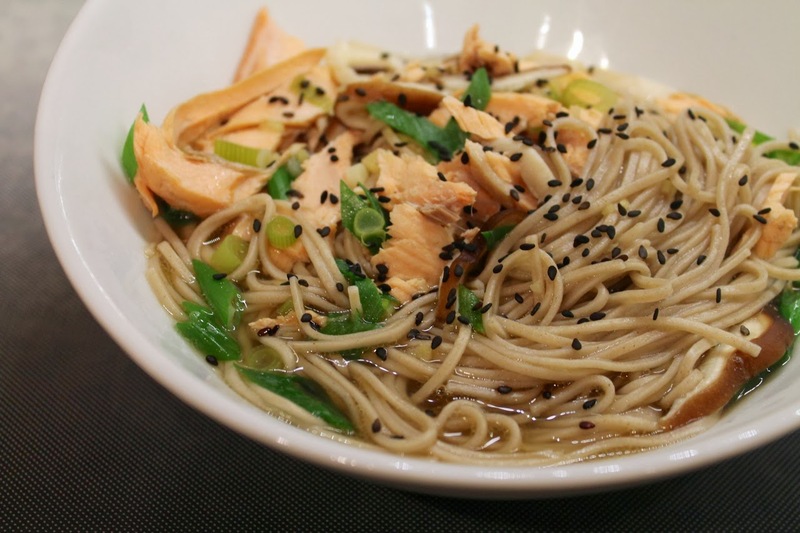 I'm finishing Winter Soup Week with this simple Asian salmon and soba noodle soup. If you're in the mood for something warm but that isn't overpowering flavor-wise, this is a nice choice. The broth is everyone's favorite umami-rich liquid, dashi, which I've used before to poach salmon. I did something similar here except that I used the dashi as broth as well and served the fish with soba noodles, shiitake mushrooms and scallions. Note: dashi is a Japanese broth made from seaweed and bonita (dried smoked fish) flakes prized for its high concentration of glutamates a.k.a. umami. 1. Bring a large pot of water to boil. Cook the soba noodles according to package directions. Drain and set aside (they cook fast, so I recommend waiting to cook them until just a few minutes before the fish is done). 2. Add dashi to a 4-quart saucepan and bring to a boil. Stir in the soy sauce and ginger. Add the mushrooms, the white parts of the scallions and salmon fillet and reduce heat to medium to simmer. Cook the fish to desired doneness, about 5 to 10 minutes. Remove the salmon and break it into bite-size pieces. Return salmon to the pot and turn off the heat. Stir in the scallion greens. 3. Divide the soba noodles into two bowls. Pour 1/2 tsp. sesame oil over noodles in each bowl. Ladle a generous portion of salmon, mushrooms and broth over the noodles. Top with a sprinkling of sesame seeds. The noodles were my favorite part of this dish. This is so fantastic. Might be the best soup I have ever eaten. It is by far the best soup I have ever made! Thank you!